Emerging startups require significant attention that is easy to grab from online sources like websites, social media platforms etc. With consumers looking towards more and more online services for ease of use and efficiency, digital marketing becomes a prominent aspect that asks for extra efforts to be put into. According to the latest information collected by SmartInsights, digital marketing in 2015 generated 3 times as many leads and cost about 68% less. 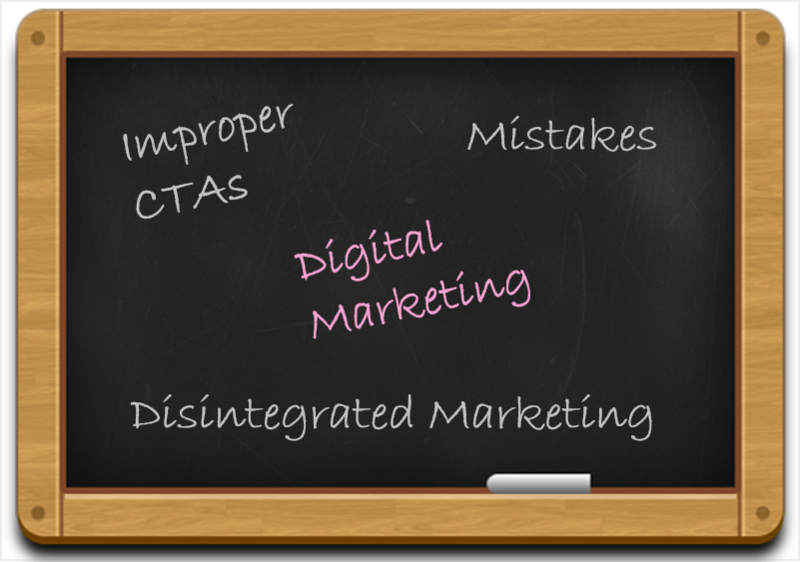 But, in the haste of incorporating digital marketing strategies, enterprises sometimes make blunders that are very difficult to recover from. Here is a list of 10 such bloopers enterprises usually make. Ad hoc activity never brings out definite results, may it be in any aspect. Same goes for digital marketing as well. Simply putting forth your services on any media will not prove beneficial. A digital marketing strategy must be cohesive and carefully formulated targeting that specific audience which has the ability to turn into potential customers for the business. While it may appear that updating your business on every platform at hand will provide you ample exposure, it is usually one of the biggest blunders SMB’s make. Why? Because SMB’s have a lot on their plate initially with amassing customers to providing impacting services being the one on priority. With a low budget, it becomes difficult to efficiently manage multiple platforms and how viewers are responding to your services marketed. So it is considered advisable to start with a single platform and scale it up as you go. It is essential to have some published content supporting your business, explaining your services and capturing attention for your products. When it comes to content, experts always recommend search engine optimized work so that you don’t become invisible in search engine’s eye even after being on the Internet. But focusing too much on preparing your content to satisfy search engine is not a correct practice. The content should speak to visitors and not the search engine. For SMB’s, it’s a common misperception that since they have not scaled yet, it is alright to skip appointing a Program Manager. It is true that SMB’s do not employ a large workforce and it is a tad easy to monitor tasks but even then individuals working in an enterprise are different and cannot be termed as a cell no matter how closely linked they work. A Program Manager keeps this check and monitors company’s growth by centralizing the incoming data from digital marketing. While dealing with a lot of data and multiple platforms, enterprises usually resort to automatic updates. This resolves the complexity but degrades the quality which is something SMB’s cannot compromise upon. Automatically posting content seldom results in poor formatting and bugs that need to be corrected before the content goes online. Blindly going on with digital marketing without glancing at outcomes is futile. NEVER ignore analytics. Observe the responses on social media, use specific analytic tools to observe and expand the content’s scope and exposure. Look for patterns of how customers are pooling and act upon them to make optimum profits and increase clientele. Do you know how your business can get high conversion rate with low cost per conversion from potential clients? Yes, Remarketing! Target people who did not convert into your customers from the first platform. Show them about your services through an alternative medium through cross-channel remarketing. Emails are a method of spreading the word about your services, so the word should be good! Uninteresting, bland and complete text emails are not appealing. Email content should be visual and attention-grabbing so that the receiver wishes to learn more about your business and products. 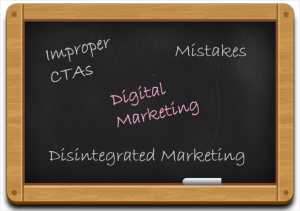 Since digital marketing is going to span itself on multiple platforms eventually, it should be integrated to the core. For instance, a business is making some proposal on Bing that is completely different from that posted on LinkedIn, will create confusion among the viewers. Make sure similar posts are updated on same time across platforms and should be coherent. Call to action is the only thing linking your posts to the business content and hence, should be strong, standardized and attractive. Improper CTA’s are most of the time the prime reason for customers to avert from your business. Catchy lines and proper hyperlinks should be mentioned.